Antitrust watchdog’s ridiculous acts revealed. August. 21, 2018 07:24. . 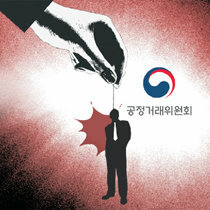 Though called an “economic policeman” of the country, South Korea’s Fair Trade Commission (FTC) is two-faced in reality. It is an antitrust watchdog fighting against injustice often practiced by large conglomerates to protect small businesses, subcontractors, and consumers, but it is also considered a villain, at the same time, that abuses its authority and acts high-handedly against companies. The prosecution’s latest investigation reveals that the watchdog has behaved almost like a gangster. The annual salary of 260 million won, the provision of a company car with maintenance allowances, and a corporate credit card with the monthly limit of 4 million won. These are some of the details of the contracts that former FTC chief Jeong Jae-chan and other top executives reportedly determined when forcing a conglomerate to hire one of the commission’s retirees in 2016. It is inconceivable that an agency exercises its influence as such, even suggesting an annual salary and the limit of a credit card. According to the prosecution’s announcement, the list of companies that have been forced by the watchdog to hire its former executives mostly included conglomerates that had to be under scrutiny because of their governance structure, merger and acquisition deals, and advertisement, or distribution companies, which have constantly experienced trouble with consumers. This means that the corporate watchdog has abused its “expertise” for its own use. The FTC may be hardly the only government agency arranging jobs for its retirees. The Ministry of Land, Infrastructure and Transport, the Ministry of Trade, Industry and Energy, the Financial Services Commission, the Financial Supervisory Service, and other influential ministries and institutes usually have control over private companies. Thus, there would be no reason for these companies to say no to having retirees from the state agencies, who may have an established relationship with incumbent public officials. In other words, government agencies and private companies are entangled in a vicious food chain. The FTC may have been more desperate in landing jobs for its retirees as, unlike other economy related ministries, it does not have an affiliated public enterprise. This is not the first time that the FTC’s executives were indicted by the prosecution. It may be just a coincidence, but the watchdog’s inappropriate practices have been always brought to the attention whenever the new administration launches and conflicts arise between the prosecution and the commission over an exclusive right of complaint. “Though the FTC’s obligation is realizing the principles of fairness and competition in the market, it has been monopolizing its authority of administering the law,” said FTC chief Kim Sang-jo, signaling that the commission’s exclusive right to file complaints is not irrelevant to the latest scandal. Still, the FTC first needs to thoroughly reflect on its unjust practices and come up with anti-corruption measures, regardless of developments in its fight to keep the right of complaint.